When Kimmel returned, he did. Becoming emotional immediately as he spoke of the 17 dead and dozen wounded in Parkland (most of them high school students), Kimmel, once again, made a direct, furious attack on President Donald Trump and Republican lawmakers. 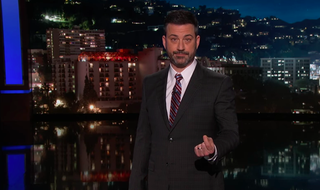 Calling them “allegedly Christian men and women who stuff their pockets” with National Rifle Association cash, Kimmel excoriated those politicians who inevitably offered nothing but the now de rigueur “thoughts and prayers” while scolding Americans who dare to talk about gun control legislation. Playing clips of Trump’s one-day-later public statements about the massacre (carried out by a teenager with an AR-15 assault rifle and ties to a Florida white supremacist group), the tearful Kimmel broke in twice to call out a clipped “agreed” in response to Trump’s own words of consolation to the victims and families of victims. But after Trump promised these latest victims that their government would do “whatever you need,” Kimmel ripped into the maddening pattern of words without action that has invariably made up the GOP’s playbook after another gun-related national heartbreak. Pointing out that one of Trump’s first acts after taking office was to repeal a rule signed by President Barack Obama intended to keep people with severe mental illnesses from possessing guns, Kimmel snapped, “You’ve done worse than nothing.” He also noted that Trump’s emphasis on the Florida shooter’s alleged mental illness (at the expense of any mention of gun control) hypocritically ignores the fact that the Republicans’ attacks on healthcare have undermined treatment options for people suffering from mental illness. After a woman in his audience yelled out, “Do something now!” Kimmel steered viewers to the anti-gun violence group Everytown For Gun Safety, and warned Republicans that they “forgot that they work for us and not the NRA.” Like The Rundown’s Robin Thede (one of the only other late-night hosts on duty this week), Kimmel also reminded viewers that the midterm elections are coming up in November, and that, like him, Americans are “very, very, very, very tired” of watching lawmakers with ties to the gun industry offer nothing but platitudes in the wake of each all-too-thinkable horror.